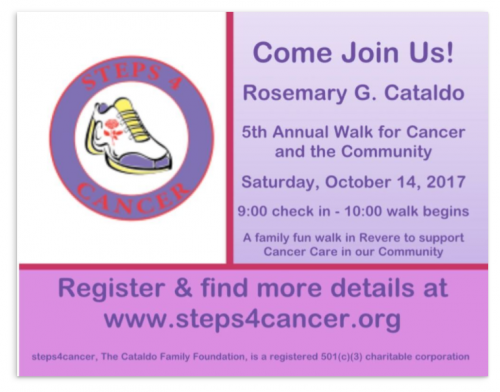 Thanks to the generosity of our supporters, Steps4Cancer has awarded 10 Cancer Care Grants to citizens of Revere who are currently undergoing cancer treatment and 4 scholarships to Revere High School graduates who have demonstrated a commitment to community service in Revere and/or are pursuing advanced degrees in a healthcare related field. We have also supported 4 awards for nurses at the Dana Farber Cancer Institute in Boston to promote and support their relationship based nursing practices which positively impact the patients under their care. See the blog post below with contributions from two nurses who have benefitted from this program. If you would like to support our efforts with a donation, click on the following link, or you can mail a check directly to Steps4Cancer, 14 Proctor Avenue, Revere, MA 02151. She says it in jest, but Lane insists that often it winds up being true. Dana-Farber adult and pediatric nurses share a dedication to their patients and each other that translates to longevity. To mark National Nurses Week May 6-12, Lance and fellow Dana-Farber nurses Laura Ma, RN, BSN; Despina Stavros, RN, BSN; and Kristina Wickman, RN, MSN, share what drew them to oncology and what they enjoy most about it.